How to see the greenflash two times ! Only few people have seen the green flash. But you can see it twice by sunrise or sunset. Interesting, isn'it? N is the refractive index, i is the angle of incidence and r is the angle of refraction. But index n depends on the wavelength and by the color of the incident ray refraction is not the same. The light from the Sun is decomposed into its component colors. 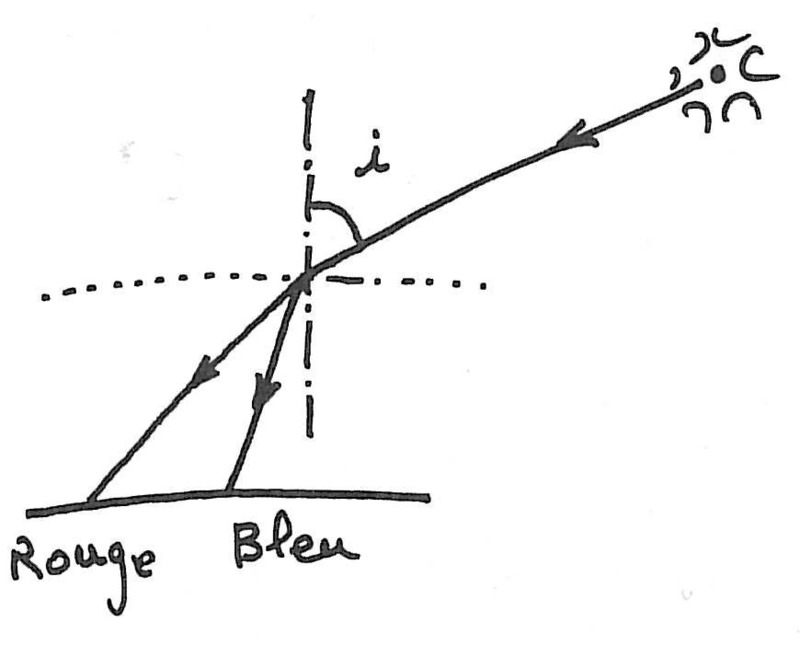 The "blue" is less deviated because the refractive index is greater for blue than for the "red"
(Figure 2 illustrates what happens). The effect is imperceptible, at least until the angle of incidence i is low. However, at sunset or sunrise, the rays enter the atmosphere under a large angle, the refraction is strong, the decomposition is also the color (Figures 3 and 3a). An observer looking at such a sunset (Figure 3) would first see the "red" diseapear, then the "green" and finally the "blue". The last ray of light would be blue. But at sunset the path traveled by light in the atmosphere is longer. This produces a further absorption. Now it is mainly the short wavelengths that are absorbed (that's mean blue). The resulting spectrum is thus deprived of the Blue (See Note 1 below). The last rays that we see are not the blue ray but the green flash. Our circumspect commentator summarizes this phenomenon in a pithy phrase (Figure 5). Still remember that greenflash is difficult to observe. Generally it is observed during a sunset over the sea with a perfectly clear sky. 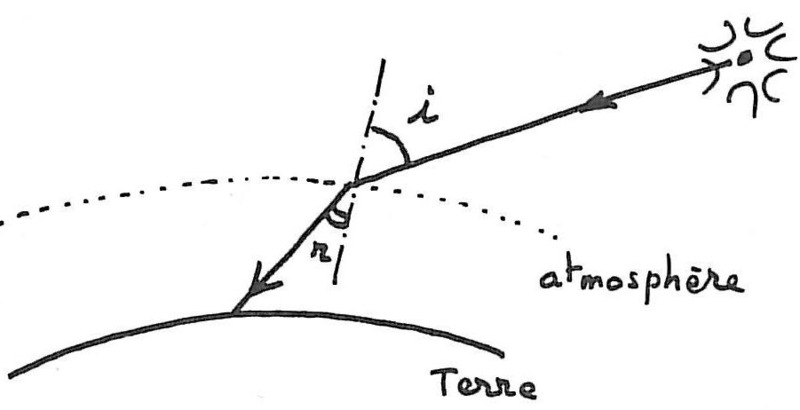 The point of tangency between the solar disk and the horizon is then a quasi-mathematical. Now that we understand that, we can imagine a method to see the green flash 2 times (or more) by sunset. In one place on Earth, the higher it's located , the lower appears the horizon and the later is the sunset ... ah! ah! You see me coming. The method is simple: We crouched and wait to see the green flash, hardly have we seen that one is a jerk (stong!) To see the green flash a second time ( Figure 4). I tried the method and "it works". One of my son also had the opportunity to test it independently (and successfully, otherwise I would not be). One can even imagine (See Note 2 below) to make a periscope and see the green flash again! We never get tired of it. You have a good way to enter in the record books. 1 - We know that the absorbed "blue" is rebroadcast in all directions which explains the natural color "blue" of the heaven (cf. 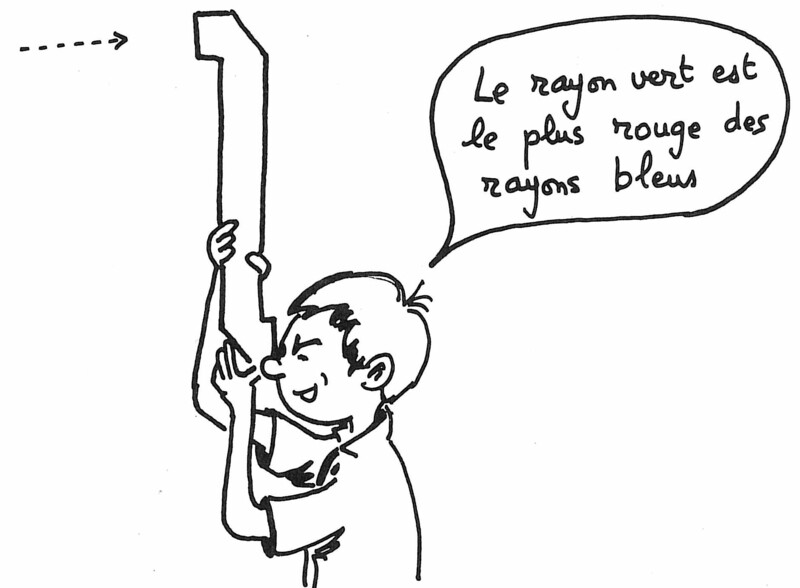 Cahier Clairaut n°4 Spring 1979). 2 - In fact, this idea was suggested to us by famous astronomer Gerard de Vaucouleurs.